The following are pictures of the pumpkins. I've been out of town for the last 10 days so I've got a lot of vine burying to do. The whiter pumpkin is the pumpkin on the 747 Johnson plant. It is by far the faster growing pumpkin in the patch, but well behind the biggest pumpkin's of the past, growth curve wise. Damage from winds and cold nights have been a big challenge. I like the smooth skin on this pumpkin. Shape and color are all from the 282 Scherber side. Almost everything about this plant has looked like the 1725 clone that is the grandparent. It makes me wonder what this plant could have done in better circumstances. Lot of growing left to go however. We are just getting into the fast growing phase, so it will be interesting to see if this plant can make up some for lost time with the warmer nights we are having right now. 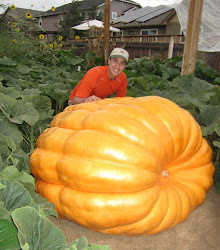 I'm going to call this pumpkin "Jumbo" since it is from the 747 seed. The yellow/orange pumpkin is the one on the 1685 Scherber plant. It is growing slow, but picking up some speed. I have another pollination that is 10 days old that I'll probably go with and will take this pumpkin off because the plant was small when it was pollinated and the position on the vine isn't great. 10 day measurements were considerably bigger on the 2nd pumpkin, so we will see what growth looks like over the next few days and then make a decision.